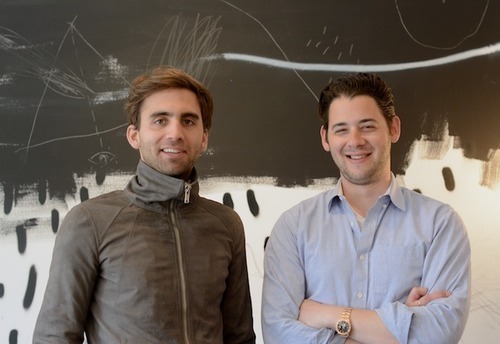 Ari Heckman and Will Cooper, are the founders of the New York-based, interior design and real estate development firm, ASH NYC. 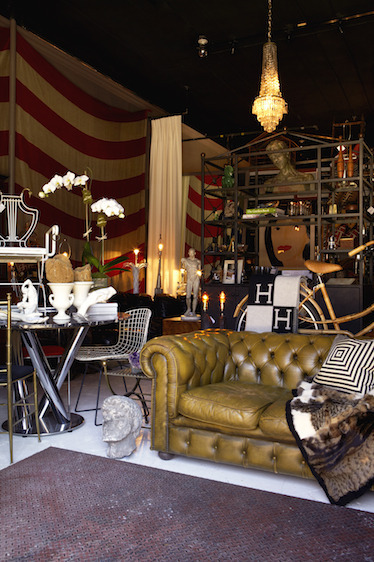 The firm has a storefront in Williamsburg, which has the same welcoming and eclectic feel as their interiors. 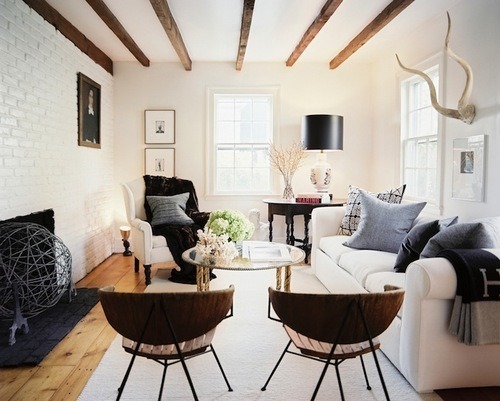 An assortment of new pieces, sit alongside vintage treasures in this eclectic space. 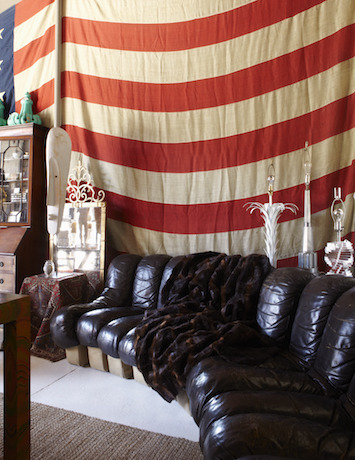 Walking in, one will find an oversized American flag and artwork with one-of-a-kind pieces such as antiques, globes, busts, barware, and furniture. 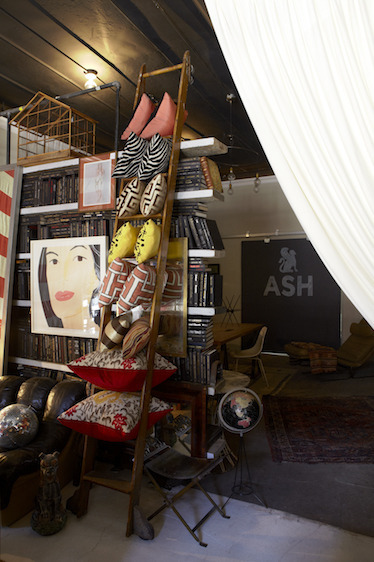 One of ASH NYC’s most recent ventures was the former Abingdon Guest House on Eighth Avenue, in which they housed their month long pop-up shop where they launched a hand-selection of their high-end vintage and antique finds from across the world. The pop-up displayed custom pillows and upholstery designed by ASH NYC, furniture and fine objects from prominent designer Anna Karlin, custom Le Labo scents, Rizzoli New York titles such as Fornasetti to Locker Room Nudes, and a curated selection of prints from renowned photographer, Adrian Mesko. We are ASH NYC, a design and development firm based in New York City. We are a little different than your traditional interior design firm in that we design, develop and own many of our own projects, while also doing contract work for outside clients. 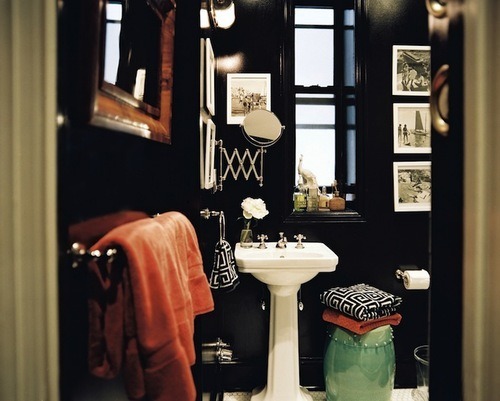 Our aesthetic can be defined as the interplay between simple, clean modernity and historical integrity. 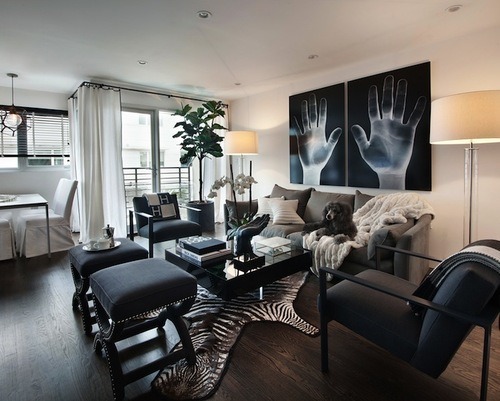 We love creating layered spaces, and rooms and buildings that feel organic and not overly designed. Ari is the CEO of ASH and Will is the Creative Director. Our office is in Williamsburg, Brooklyn. It is the ground floor of an old fire station, back when horses were used to drag the fire equipment around. We took over in 2010, and converted the space from its most recent use, a kosher ice cream factory. Ari: It was never really a choice, it just happened. I grew up in a family that was involved in real estate and design so it was sort of in my DNA and I was exposed from a young age. Both are industries that are hard to break into and learn if you don’t have an example before you. The company has evolved as we’ve realized that the intersection between the two industries is sort of under explored. Will: For me I suppose it was happenstance, as well. I was a very curious and entrepreneurial child, starting a business as a disc jockey at the ripe age of 10. I was essentially “schooled” by working for Ralph Lauren in global retail brand development out of college and eventually left to work with Ari. There is a lot of excitement and opportunity when occupying a niche sector of a flooded market. I work best when challenged, and creating a brand that touches on uncharted territories is what keeps my wheels turning. Ari: Actually, yes, but I wouldn’t have known the verbalize it as such. It’s pretty amazing, we get to do so many different things on a weekly basis, and the interactions with different types of creative people is pretty limitless. On any given week, we may be negotiating and buying a piece of real estate, designing a client’s home, refining the details of a product that we are creating and bringing to market, or sourcing amazing vintage furniture to resell via our store or 1stdibs. You can’t possibly get bored…. Will: I don’t even think of it as a job, so the answer must be yes. The lines of work and pleasure are constantly blurred. I have so much fun doing what I do every day, and every day is different. We are afforded the opportunity to cross paths with so many insanely creative and talented people given the range of projects we work on. Everything from studio visits and design meetings to demolition/construction sites and art openings. This is not your average 9-to-5. Ari: There isn’t really much difference between the two at this point. I don’t have a fine line where I turn one off and turn the other on. I feel like I am pretty much working and playing simultaneously, so there isn’t such a distinction. Will: Like I mentioned before, the line is so blurry that it is impossible to distinguish between the two. Even if I am “playing,” I am likely noticing a design detail in some form or fashion that is noted and taken back to the team. Inspiration is everywhere. Ari: I think the most exciting thing is completing projects that I feel personally proud of and then introducing them to the world at large and seeing how the feedback comes in. It’s sort of a vulnerable position but also really exciting because it’s the first time to actually assess how something translates from your mind into concrete reality. Similarly, when we complete a real estate development and people start to move in, or visit the hot new restaurant or whatever, you get the sense of completeness and satisfaction watching the spaces actually being used. Will: To me the most exciting thing isn’t really a “thing.” The excitement for me is really the relationships that come out of the work that we do. To be able to engage artists and fabricators to create exquisite spaces and pieces is so rewarding. Obviously the end result is the huzzah moment, but the process, albeit sometimes slow and painful, is so educational and fulfilling on many levels. The information and experience that comes from working with such skilled beings is something that you can’t put a price on. The dream situation is to continue to work with and build upon the talent pool that is the creative world. Ari: Combination of travel, endless perusing of magazines and the internet and the richness of some of the historic places where we work, like New York, Sag Harbor and Providence. I’m not sure I am actively seeking inspiration, it’s more in what you are able to discover from what’s around you. Will: It is everywhere. I like to look at details of buildings and art and fashion and dissect how someone arrived at the end result. I really enjoy process, I suppose. I like knowing how everything works, and that ultimately informs my processes. I take cues from many different worlds and meld them all together. I think it’s the only way to be aware of how the creative world is evolving. Ari: I would say conservative and traditional but with a touch of the unexpected. I love juxtaposition, and I love showing off one or two really amazing, valuable, timeless pieces and then everything else white or black. I don’t really give much priority to clothing; I’d rather spend my money on an amazing marble slab or a rare vintage watch or something. Will: My personal style is pretty minimal. I like simple, clean lines. I have multiples of the same things in my closet and keep them on rotation. The palette is neutral; I don’t wear any color. Grey, black, white, taupe, navy. A lot of Margiela! I think this translates into how I like to see spaces, as well. I like really simple and clean architecture with expertly crafted pieces sitting within. That doesn’t always translate when you introduce a client into the mix, but I try to influence them in some form or fashion. Ari: I don’t have a good voice but I love karaoke. 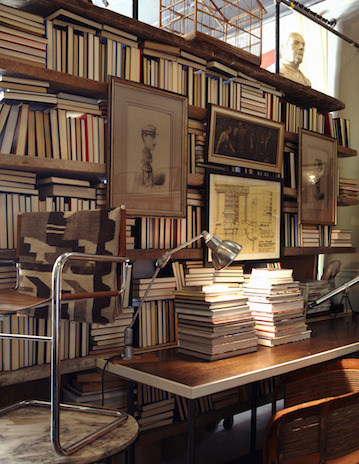 Will: I am extremely OCD and everything has its place in my home.